Self Storage in Redwood City, CA at 871 Willow St. Extra Space Storage is conveniently located for residents of Redwood City and surrounding areas, including Centennial, Staumbaugh Heller, Redwood Village, Fair Oaks, and Redwood Junction. 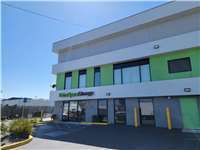 Our facility is just off Willow St. between Bay Rd., Spring St., and Woodside Rd. Locals will recognize our location next to Bosch European Motors. We're also accessible for those living in nearby apartment buildings and complexes, including Redwood Court Apartments, Marymount Apartments, and Avenue Two Apartments. Our Redwood City storage facility has a wide range of storage unit sizes, climate-controlled storage, and advanced security features. We can accommodate almost any storage need. Storage units at our Willow St. facility start as small as 3x5 and go up to 12x38, so we can handle residential and commercial storage needs. Our units come with several features: indoor access, first-floor access, elevator access, drive-up access, and climate control. If you have questions about which storage unit is best for your needs, don't hesitate to contact us. Our staff is more than willing to answer your questions! Climate control keeps the temperature in your storage unit between 55°F and 85°F at all times, which protects sensitive items from fluctuations in temperature that could cause damage to belongings. Extra Space Storage on Willow St. strives to provide secure storage for customers and their belongings. Our facility has advanced security features, including video surveillance with multiple cameras throughout our property, electronic-gate access for personalized entry, and security access to your floor only. We also have a resident manager who lives at our facility for additional security and peace of mind. Come experience the Extra Space Storage difference at our Redwood City location. Our facility is clean, secure, and well-maintained, and our friendly, professional staff is always willing to help out with whatever you need. Be sure to take advantage of our excellent move-in specials, too! We offer first month free and first month half off for new renters. Feel free to give us a call or stop by our facility for a tour. good prices and very clean. great customer service.. This storage facilaty is very easy to find great location. We are impressed with the friendly staff and super clean storage units . We have found the extended hours of very helpful. Using Extra space storage is a good way to place things you want to be safe. Extra Space Storage has great pricing and customer service. The service rep found the perfect space what I needed. Set up was a breeze. Easy access to units. I would highly recommend anyone using the RWC facility. The storage is clean and accessible at any given time l would spread the news to my friends. Extra Space Storage has a great facility, with climate controlled units, elevators, hand trucks. The staff is very responsive and willing to go the extra mile to make sure we have a good experience. The access hours are very convenient and the space is extremely clean. The staff made my experience incredibly easy. They are pleasant and professional. The units and the buildings are clean and secure. We are very pleased with the facility and the value we are receiving. The staff has bent over backwards to be helpful and make our moving and storage as painless as possible. The facility has a small parking lot, the keypad on the door needs to be fixed, and the increased prices! However, they are in a convenient location and the staff has always been nice to me. I'm pretty happy with this facility. the only criticism I have is that the location is a bit sketchy at times. I tend to visit my storage space at off hours and sometimes there are odd folks in the parking lot or the facility itself. I sometimes smell cigarette smoke and food in the hallway (what exactly do folks do at storage units?). beyond that, the location is super-convenient for me. the staff is pretty responsive. the entry keypad was recently malfunctioning (I couldn't enter the space from my usual door) and it took almost a week to fix. Recently we decided to downsize our storage from the 10x10 that we already had from this facility to a 5x10. From the National Call Center to the local manager, the service and response was excellent. It was a lot of work for us and it helped us a lot when they found a unit on the same floor around the corner from the old one. The local managers made it a smooth and easy transfer for us. The facility is clean and security works. I called several other companies for the best price and it turned out that this facility was the best price so we stayed with them. Very pleased. Both Kathy and David are courteous and have always gobe the extra mile to assist me. The facilty is always clean and cared for. The location and hours are very convienant. I feel that my personal belongings are safe and well looked after here. i have arecomended friends to the storage, because i feel very satisfied with the service. Extra Space Office is on backside of Woodside on Willow St.
From Highway 101 South take the Woodside Road (Highway 84 West/Seaport Blvd) exit. Come down Woodside 84 West- go 2 stop lights to Bay Road and turn left/south. At the first right is Willow St. Office is on the right/north side of the road. Take Seaport to Woodside Road. Turn south/left onto Bay Road. Make the first right onto Willow St. Office is on the right/north side of the road. On Woodside Road East- take Woodside (Highway 84) to Bay Road. Turn South/Right on Bay- first right onto Willow St. Office on the right/north side of road.